I really enjoyed this book, but have to admit that the cover doesn't represent what I read very well at all. In my mind, Wesley may be a geeky academic, but he specialises in pirates (! ), he runs to keep fit, and he is not immature. It is rare for me to mention a cover, but I think that you may underestimate how good the book is based on it. This is a sweet, fun read about two men who found that life got in the way of their marriage. We are straight into the story in present day, but get a few insights into Sam and Wesley's earlier years together along the way, and just what went wrong. Sam is prepared to do anything to fix things, but Wesley needs something else, and it is a race against time for Sam to work out just what that is. I loved the side characters, such as Jeffrey and Cyrus, as they added a positive element as well as being fun. The filming elements are entertaining, especially some of the terrible lines! If you want a book with a lovely outcome and a fun way to get there, this is just right! Shira writes what she loves, be it contemporary musicians, shifter mermen, or time-traveling vampires. Her Mermen of Ea trilogy book, Into the Wind, was named one of the best books of 2014 by both Scattered Thoughts and Rogue Words and Hearts on Fire Reviews, and was a finalist in the 2014 Goodreads M/M Romance Member’s Choice Awards. Her Blue Notes series of classical-music-themed gay romances was named one of Scattered Thoughts and Rogue Word’s “Best Series of 2012,” and the most recent book in the series, Dissonance, was named one of the best books of 2014 by Hearts on Fire Reviews. 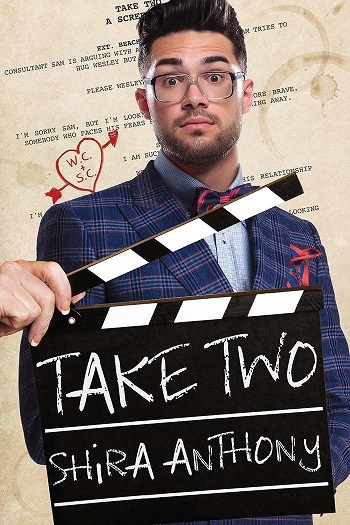 Reviewers on the Wicked Reads Review Team were provided a free copy of Take Two by Shira Anthony to read and review.